Dr. Bernd Beber is an expert in the field of conflict prevention and mediation. Currently, he is Assistant Professor of Politics at New York University, with previous posts as a research fellow at Nuffield College at the University of Oxford. He obtained his PhD at Columbia University. In this interview, Dr. Beber pointed out that current researchers study structural, geographical, ethnic, and economic factors to understand more fully the context in which conflict prevention takes place. Other variables of interest include attributes of the conflict such as the intensity, duration, etc. Finally, researchers also assess the third parties engaging in mediation and study their actions. A recurring challenge of prevention is to prevent conflict from a long-term perspective, rather than merely reacting to the latest crisis. This is not easy to achieve in practice. “I think it is actually quite difficult, and I say that as a researcher, but I imagine, from a practitioner’s perspective, it’s just as difficult to predict cases that are likely to escalate,” Dr. Beber said. The interview was conducted on December 15, 2011 by Francesco Mancini, Senior Director of Research, International Peace Institute. 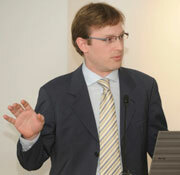 Francesco Mancini (FM): Professor Bernd Beber is Assistant Professor at NYU’s Wilf Family Department of Politics. His research uses statistical analysis and formal modeling to study international conflict and cooperation. His research focuses in particular on the causes and consequences of international mediation in wars. Thank you Professer Beber for speaking with the Global Observatory today. Still a relatively young discipline, what can you tell us about the current state of research on conflict prevention? Which trends do you observe? Are there different approaches across regions? That is, depending on the origin of the researcher, the location of the conflict. How you see the field evolving? Bernd Beber (BB): I think there are a number of questions that researchers in conflict prevention have really made a lot of progress on, and I would group them into four categories. The first one is contextual factors. I think researchers have linked the effectiveness of conflict prevention to structural factors, not surprisingly, since the structural factors also have an effect on conflicts themselves. Also geography, ethnic composition of the populace, economic development, all constrain conflict prevention just as much as they constrain conflicts. The second set of factors that researchers have linked to conflict prevention are attributes of the conflict. So, the intensity of a conflict, for example, constrains effectiveness of conflict prevention. The third set of factors are features of third parties engaging in conflict prevention. So, here in particular, I’m thinking about leverage, I’m thinking about incentives, sanctions, carrots and sticks, even the deployment of military force alongside diplomatic action. That only usually works in the short term, I think researchers have found, so there’s potentially a trade-off with respect to the long-term consequences of this. But I think researchers have made progress in terms of linking this as one example of a future of a third-party to outcomes of conflict prevention. And finally, current research I think increasingly is turning to asking questions about the characteristics of the preventive action itself. So, as an increasing result, researchers are asking, what is it about particular attributes of conflict prevention initiatives that help make that initiative a success? One aspect in particular that I have in mind here is the question of timing. I think that’s something that not only we found out recently, but many people agree that the timing of conflict prevention is important in terms of the efficacy of conflict prevention initiative. Usually, the earlier we can intervene, the better. So I think that there are areas in conflict prevention research where we have made solid progress, and I think there are two trends in research on conflict prevention. The first I think is that, researchers have been paying more and more attention to characteristics of initiatives themselves, as opposed to structural factors. I think we’ve established a number findings with respect to features of the conflict, features of the context, but I think increasingly, people are interested in figuring out what is it about the initiatives themselves that make a difference. What is it about features of these initiatives? So in some ways, I think there is a turn to micro-level analysis, moving away from a macroscopic analysis of the conflict, to asking specifically about the characteristics of particular missions, what is it that’s making a difference here. On the other trend I think that I see in research on conflict prevention in recent years is a trend away from just correlative analysis to try to estimate causal effects. So, this is very tricky of course because conflict prevention, just like really most interactions in international relations, are fraught with complicated strategies. But I think researchers increasingly pay attention to the question of why do you see particular attempts at conflict prevention in the first instance, because that will help us disentangle them–the question of whether a conflict prevention effort really made a difference, or was it just reflective of a particular intervention decision in the first instance. So, I think there’s a trend away from just being satisfied with the correlation, to try and really figure out, either on quantitative terms or on qualitative terms, whether the conflict prevention, as opposed to other spurious, confounding factors, really made a difference in terms of the conflict. I do think there are differences certainly in terms of the research that academics conduct across the world. In the US, we tend to favor quantitative and analysis that favors strategic thinking very heavily. That’s not always the case. But one nice thing, another trend in research perhaps, is that you see researchers are increasingly connecting across the world. So it’s very easy now for me to engage with research. Also much easier now than it probably was even just ten or fifteen years ago. FM: There is often a certain disconnect between the work of policymakers and that of academics. How should insights from academic study of conflict prevention inform foreign policymakers? BB: I think the interaction between practitioners and academics is a sometimes a complicated one, but I think one that could be extremely useful. I see at least three ways in which we could make it more fruitful than it currently is. The first is that I think there is a tremendous opportunity for practitioners to engage in more data collection. So most of the data that researchers use nowadays is collected from media reports, which is good as far as it goes, but given the fact that practitioners could collect this data while engaging in a conflict prevention effort, I think is not as good as it could be. I think that if researchers actually manage to work closely with practitioners, we would be able to get the data directly from the source if you will, as opposed to having it collected from news reports. I think there really is a tremendous opportunity for data collection to be done more systematically by practitioners with researchers, and I think that would really help us some understand much better what it is about conflict prevention that works and that doesn’t work. The other way in which I think practitioners and researchers can work more closely together is in the systematic evaluation of particular programs. That goes beyond just collecting data on the program, but I think it can extend to even thinking before the program is started–about the design for evaluating the program options, in fact. I think evaluating the effectiveness of the programs, not just something that happens after program completion, but it’s something that should be on the agenda from the inception of the program. I think the researchers will be excited to work with practitioners in trying to come up with designs that will allow us to decide. And I think practitioners, I would figure, would be excited to learn the effects of the programs. And finally, the third way in which I think practice and academia can work more closely together is in terms of us academics framing results to a greater extent in categories that are actually of relevance to practitioners. I have to remind myself as a researcher frequently of thinking about a particular problem, not just in the frames that I’ve acquired within my discipline, but also thinking about it in terms of categories that matter to practitioners. That’s a challenge to researchers, and I think one that we can and should meet and that would really help in bringing academics and practitioners closer together. FM: If I can keep asking you to think as a policymaker, what measures in your view are necessary for the international community to be able to genuinely prevent conflict with a long-term perspective rather than merely reacting to the latest crisis of the day? BB: In order to prevent conflict from a long-term perspective, what I think you need is effective early-warning systems. I think it’s important to obtain information on conflicts, not just in reaction to particular crisis moments, but really as a matter of routine practice. That’s not always as easy as it may sound. Often, you hear the problem is not so much the ineffectiveness of early warning, but the gap between warning and an action. But I think there is actually a fundamental problem that we as researchers face as well, when it comes to identifying cases that could escalate to violence. The question in evaluating the efficacy of early warning systems is, among others, one of how you identify whether an early warning system accurately reported that a case is not likely to escalate relative to other cases. I think it is actually quite difficult, and I say that as a researcher, but I imagine from a practitioner’s perspective, it’s just as difficult to predict cases that are likely to escalate. For that reason alone, it’s not that easy to divorce oneself from wanting to focus on the cases that are in crisis, as opposed to taking a long view and a more comprehensive view and really making sure to pay close attention to a larger set of cases that may escalate at a later point. So, early warning is crucial, and it actually is quite challenging, and something that deserves our attention both from a practitioner’s perspective and also from a researcher’s perspective. FM: Finally, you have done work on international third-party mediation of armed conflicts. In particular, on strategies to increase the effectiveness of mediation. What are your thoughts on the role of mediators? For example, does the mediator’s nationality matter? What kind of authorities should the mediators be given? BB: The nationality of mediators does appear to matter if you look at the data. For example, American mediators appear to be relatively more effective than other mediators. Now, it’s a question to what extent that’s really about nationality per se, or it’s just a reflection of the US being able to bring greater leverage than other types of mediators to the table. But you do see variation in terms of rates of effectiveness when it comes to nationality, when it comes more generally speaking to the identity or to particular characteristics of the mediator. In the case of the US, for example, or more generally, it could be a question of leverage. It could also be a question of informational attributes. Mediators vary, for example, with respect to the amount of information they have at their disposal about particular conflicts. And, of course, that matters with respect to the extent to which they can effectively mediate different scenarios. Now, as far as the authorities that should be given to mediators are concerned–mediators, of course, I think, appreciate flexibility and being able to structure a bargaining situation, but it’s important to keep in mind that, just like in any other negotiation situation, constraints can actually translate into a significant amount of bargaining leverage. A mediator who is constrained by the sending organization in a particular manner, for example, can use that for moving disputants at the bargaining table, maybe in ways that he wouldn’t be able to move them without that constraint being imposed from outside. So, I think constraints and authority is a somewhat double-edged sword. On the one hand, you want to give flexibility to the actors, to the third-parties who are actually on the scene. On the other hand, it’s important to keep in mind that operating under constraints is actually not necessarily a bad thing. It can translate into a leverage–not of the conventional kind, not of the military kind, not in terms of sanctions or carrots and sticks, but leverage nonetheless in a bargaining situation with disputants. FM: Dr. Beber, thank you very much for talking to the Global Observatory. FemWise-Africa has an ambitious agenda which, in order to implement, will require challenging some of the foundational assumptions of mediation.